Today Altenew is releasing a Build-A-Flower: Poppy. You must be here from the lovely and talented Enza's blog. Isn't the shape of this flower gorgeous? I have coloured the images with Artist Markers. I am going to keep this post super short. I am not well and looking at the screen makes my eyes hurt. I will be giving away $20 gift certificate to the Altenew Store. The winner will be announced on my blog on 12/6. Next stop on the hop is Zinia Redo. I absolutely loved your card!! As always your coloring totally brings the images to life...Simply stunning work Erum ! Hope you are feeling much better now.Take care ! Hope you feel better soon. Lovely card. Your card is gorgeous. So striking with those colors. I LOVE LOVE this card. The colors and flowers are beautiful! I love how you colored this card! This card is so pretty . Love who you color these flowers . I am so amazed with your coloring skill as it so pretty as your usual..
Hope you feel better soon and thanks for sharing this gorgeous card. 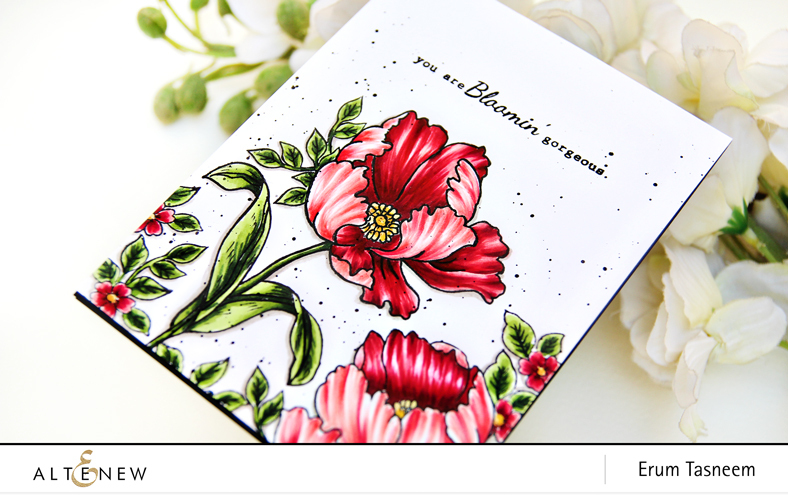 Beautiful card with gorgeous shading on the poppy petals! So very pretty! I love the detail on the petals! Beautiful card and great inspiration as always. Your card is superb. Hope you feel better soon. So beautiful! Love your marker technique Erum!! Wow the vibrant colors are stunning. love it. BeUtiful card Erum. Hope you feel better soon. Best wishes. Gorgeous card! :) Love the colors you used. Altenew's floral stamps are out of this world - and this new BAF set is stunning! Oh dear! My wish list just got longer. I saw your card on Instagram and immediately fell in love with it! It's beautiful! The colors are lovely! I think the speckled dots are fun! I love these gorgeous poppies!!! What Ana amazing new build a flower set. I love this die set and stamp! I love this card and think it is gorgeous! It’s very , very pretty ! I am loving the background with the poppy stamp set! Nice job! 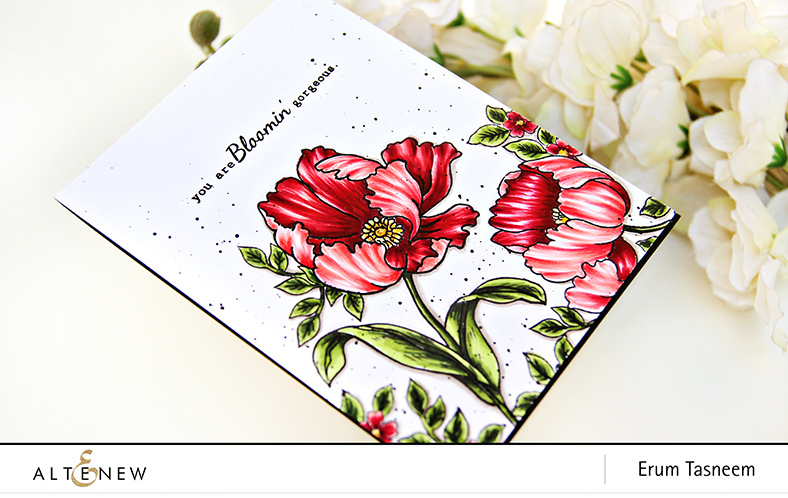 I am loving the background you used with the poppy stamp set. Nice job! GORGEOUS!!!!! Your work is stunning!!!! Another great card. beautifully done. A work of art! Gorgeous! For the Altenew flower of the month. this card is "blooming gorgeous" also! 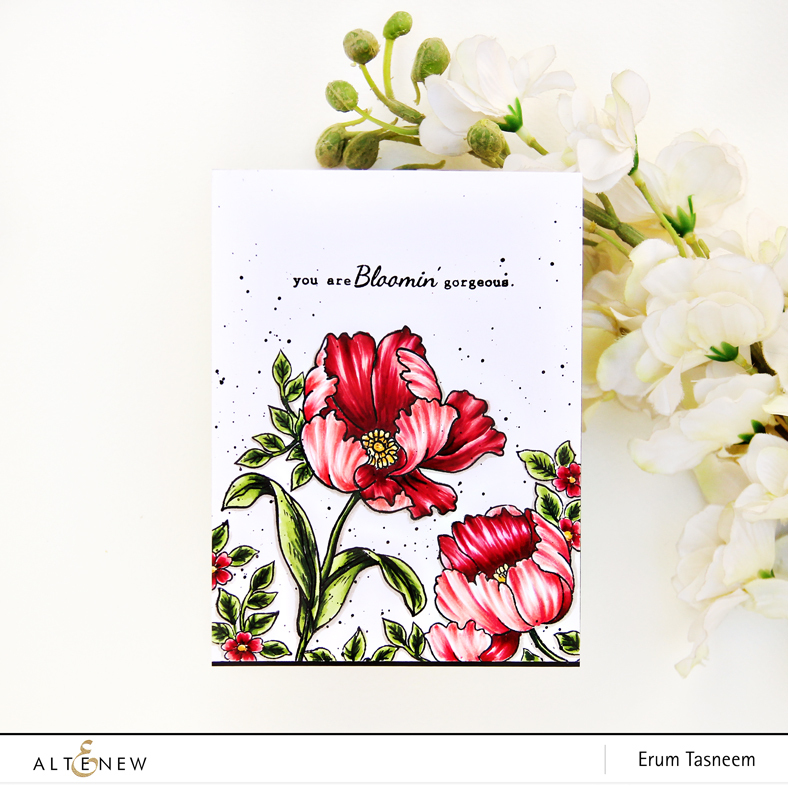 Erum your card is gorgeous, your poppies are beautifully shaded, very realistic & love the black splatter look.Thank you have showing this. I love the beautiful color you've given to these petals! It looks absolutely vivd and bright! GORGEOUS VIVID colors! I love this! Gorgeous card - I hope you feel better soon!! This is beautiful! It's a lovely stamp and you've done a fabulous job coloring it. Gorgeous card! Your coloring is awesome. Great new set. Your card is absolutely stunning!! Your coloring is amazing!! I hope you are feeling better soon!! Beautiful. I like how you colored the poppies. Very beautiful card. Love the colors. Gorgeous card! Hope you feel better soon. I really like the way you colored the poppies, Erum. They are beautiful! I hope you feel better, real soon. Stunning design and wonderful new flower set! This is beautiful! I love your coloring. Your flier is stunning! Oh oh.. hope you feel better soon... I have to say though, you’ve done such beautiful coloring on the flowers and leaves! They are gorgeous!!! Your color work is always impeccable. I hope you feel better soon. Thanks for putting in the time and effort to inspire us, despite your illness! Your card is stunning. I love the white and red combination for your poppy. It is gorgeous. Thanks for sharing your time and talent. All I can think to say is wow. Beautiful card. SQUEAL!! Such an AMAZING Project!! Can't wait to see MORE!! THANKS for sharing and for the chance to WIN!! Have a FABULOUS WEEK!! Stunning - I love the colors you used and always inspired by your amazing creations!!!! So gorgeous!!! Always inspired by your stunning creations!!! Beautiful card!! Your coloring is always gorgeous! Stunning card!!! You coloured it so beautifully, you really captured the movement and the delicacy of the bloom perfectly! 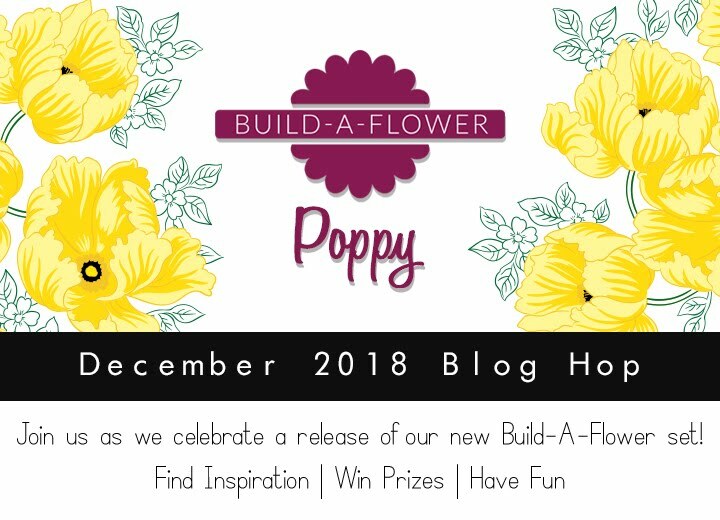 I love this new Build A Flower set, Poppies are one of my very favourite flowers. I really hope you feel better soon! Beautiful Card! Hope you feel better soon! Gorgeous card and I love the way you colored the flowers! So pretty! The new BAF Poppy is so beautiful. Your coloring is amazing. You know the "oohs" and "ahs" you say when you see fireworks? That's what I said when I saw this card. It's just beautiful. The color is amazing! Beautiful coloring and the black splatters on the white background make the poppies pop. Simple, yet eye-catching card! Beautiful card. Love the flower colors. Beautiful card with amazing coloring. Feel better. Your card is gorgeous! I love the layout and the beautiful colors! I hope you're feeling better soon! Love the new stamp set. And the inspiration card is gorgeous! Absolutely love the bright colours you have used! I love this BAF! And yes it is stunning. This is going on my wishlist for sure. Hope you feel better soon do you can have a happy holiday. what a gorgeous card and new flower release-I must have this set!! Absolutely gorgeous card! I love the variation from the deep red to white! Love this set! The colors pop! The card is gorgeous! Feel better soon! I just love this poppy set. I think it may be my new favorite. Your card is gorgeous. TFS! Lovely card, Erum. I love your coloring and shading of the poppies. Stunning! Absolutely amazing coloring and composition! Your coloring is so vibrant and textured! Beautiful! WOW! Amazing coloring and Gorgeous card! Your card is gorgeous! I hope you are feeling better. Stunning project. Your coloring of the flower is beautiful!! I love this card. The big bold flower is colored beautifully and the sentiment really makes me smile! Love the colors you used on your beautiful card! Very nice. I hope you are feeling better soon. LOVE these beautiful layered flowers and leaves, ADORE your colour combo and elegant design - WOW! Love this card, so very, very elegant, the vibrant colors are outstandanding, even the splatters look stunning. Hello Erum.. Hope you are doing well!! Guess you missed this winner announcement..
Altenew: New Video and Stencil Release Winner!